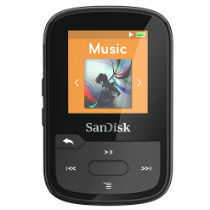 The affordable, lightweight SanDisk® Clip Sport Plus MP3 player gives you the freedom to work out the way you want. Durable and water-resistant1, it’s ready for a muddy mountain bike ride or a trail run in the rain. Use the lightweight earphones included or enable the Bluetooth® wireless technology and pair it with your favorite Bluetooth wireless headset. With 16GB* capacity, songs. You can clip up to 4000 songs2 to your clothes. Stop worrying about your device and focus on your workout. Durable and water-resistant1, the SanDisk Clip Sport Plus MP3 Player stands up to tough workout conditions—rain or shine. Pair the SanDisk Clip Sport Plus MP3 Player with your favorite Bluetooth wireless headsets for even more freedom in your workout. Clips on to your clothes or gear and stays put for a worry-free workout. Tune in to your favorite FM stations or connect with the entertainment system at your gym. With enough battery power to last for up to 20 hours4 on a single charge (wired headset), your SanDisk Clip Sport Plus player has the stamina to keep up with you for multiple workouts before it needs to recharge. 16GB* capacity holds up to 4000 songs2 so that you’ve got enough music to carry you across the finish line or through your final reps.
1IEC 60529 IPX5: Tested to withstand water flow (12.5L/min) at 3 min. Must be clean and dry before use. 2Based on 3.5 min songs @ 128kbps bitrate. Approximations: results will vary based on file attributes and other factors. 3FM radio functionality requires wired earphones. 4Based on continuous playback at 128 kbps MP3 with wired earphones; up to 7 hours using Bluetooth; actual life and performance may vary depending upon usage and settings; battery not replaceable.